Detailed on an official launch page for the product, Google quietly rolled out a new micropayments function for Google Wallet that allows site owners to charge small amounts of money for Web content. For instance, a site like Oxford Reference can charge between 25 to 99 cents for access to a single page of content. Within this live example, Oxford Reference offers the opening portion of the page for free. However, the code for Google Wallet is overlaying the remaining text with gray bars and blurring out the pictures until the reader pays 99 cents to view the remainder of the page. In addition, the reader has the option of an immediate refund of the access fee if they feel the content wasn’t a worthwhile purchase. 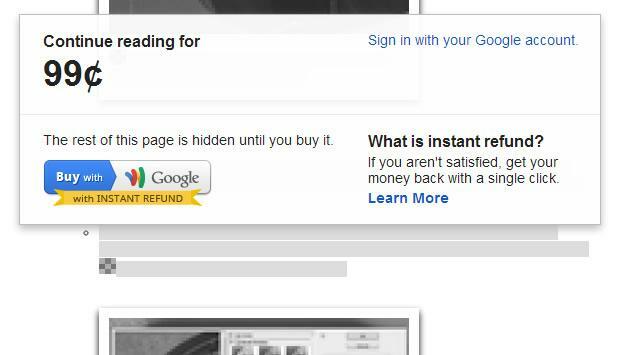 However, the reader has to apply for the refund within 30 minutes of the initial purchase and Google has setup a system to help curtail excessive refunds awarded to a specific user over time. Once a reader has purchased the content, they have access to it forever. A record of the purchase is noted on the Google Wallet account and Google also offers an archive service to keep the content available to users if the site shuts down or goes offline for an extended period. While readers have to sign up for a Google Wallet account in order to pay for content, Google Wallet has been around for years and is commonly used by popular online retailers. 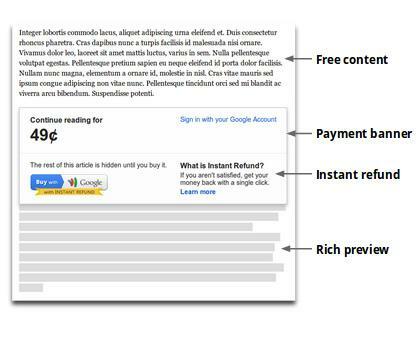 Interestingly, this micropayments barrier also ties into Google search rankings. Google will only look at the free preview content to rank the page, not the entire article. While this is designed to encourage site owners to give away a sizable amount of the article for free, it could also backfire on site owners that attempt to cover up too much content on a page. Site owners can also specifically choose portions of the page to blur or redact. However, advertising like banner ads are still visible and aren’t covered up by Google’s software. Google hasn’t released any information regarding the company’s revenue cut of the micropayments processed through Google Wallet. Currently, Google is limiting the amount of organizations that try out the new feature to educational sites owned by Pearson and Oxford University Press. However, CNET indicates that Google has partnered with GigaOm and the Motley Fool as well. After applying on this page, it’s likely that sites have to install a section of code on specific pages in order to outline portions of content that will require a micropayment. It’s likely that Google will create plug-ins for popular content management systems as well in order to facilitate a smooth launch process for site owners. During the past two years, newspapers have attempted to solve the issue of declining print subscriptions with the installation of the online paywall. Hypothetically, a newspaper could use Google Wallet to charge for popular articles on a more granular level. It could also allow newspapers to take better advantage of Google search traffic by offering an increased amount of preview text compared to current online paywalls.